Placed at the base of the mighty Himalayas and the Karakoram mountain ranges, Ladakh boasts of owning a varied yet picture-perfect landscape. Famed as a Buddhist ex-kingdom, the region is dotted with a number of attractions, Gompas or monasteries being the most popular of all. 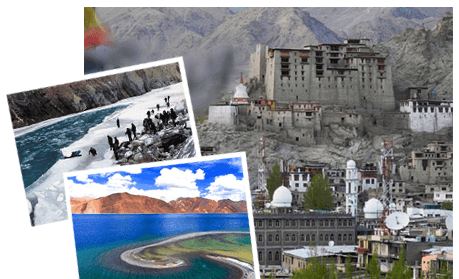 Also referred to as the 'Land of high passes', Ladakh has been bestowed with natural beauty in abundance, which attracts a decent number of tourists, from all around the world. It is an ideal destination for honeymooners, family vacationers as well as adventure enthusiasts. You can enjoy the pure lakes, rivers, snowy peaks, wildlife, adventure sports, ancient monasteries, the wooden handicrafts, the food, interact with warm locals, handwoven woolens and much more.